[T/N]: The “찰칵” is the sound of a shutter of a camera snapping. Junsu meant HE TOOK A PICTURE OF HIMSELF–he was teasing fans! Please do not modify or delete credits. is he saying some creepy person took a pic of him? im confuse. okay so i am not alone in that thought. i don’t know how they sleep at night. i would be too scared to close my eyes. yup, those hideous and despicable acts would surely make anyone feel paranoid..so creepy! but on another thought, as i posted below, why is junsu laughing? is he being playful or is this his way of coping with it by sending them the message that “i know you are around…again, but i will not dignify your acts and presence nor allow you to ruin me just like what you did to my hyung jae…” could the laughter be his sarcastic response to sasaengs? i was thinking the same thing, i guess we will never know for sure. I hoping that we misunderstood that tweet cause i want xiah to be safe (for now, dang those stalkers). i really hope that korea makes laws to protect celebs like jyj from those criminals. In my country, it wouldn’t have taken so long to take action against those criminals. this is very very scary, the tweet creep me out but its Junsu who is more freaked by this , he just laughs it to calm himself down. he knows its a saseng , we might not know this but Junsu may have experienced sasengs inside his house before. i wonder if he had felt a sasengs presence while he pretended to sleep in order not to ignite her into action. so he would close his eyes and pretend to sleep and hoping she would leave soon. i don’t know i just imagined such a situation could have happened. i have been thinking , i don’t know korean but if one of u does, tell him to hire a security gaurd at his home , so when he leaves the security gaurd watches over the home. even when he sleeps the security is close by. i think this is a good idea for Junsu’s and Jaejoongs and Yoochun’s safety. @pierrot honestly, i don’t know how they handle this for so long. i wouldn’t have last a day. me and my sis discuss about security guards option as well but my sis point out that security guards could be bought out for the right price since these sasaeng seem to have a lot money. if they can blow that much money on taxi, imagine how much they are willing to pay the security guard to turn the other cheek. er , i know u mean well and ur right , but we aren’t actually his security guards , i think he is still scared , the snap shot taken of him , is scary. its a saseng he tweeted this because he is scared or was scared , he probably took a look around or something and found nothing, stalkers are good at hiding, then he went showered and tweeted this before going off to bed. he might have felt there isn’t something there maybe just my imagination and tweeted to cheer us up. i hope he is safe. but really what is that snapshot , could it be a saseng ? i have a bad feeling it was a saseng, but this is a theory an assumption. because who ells would take a picture of him , and maybe he just thought it was a or maybe it really was but he don’t want to scare himself. i didn’t mean anything i don’t really know how to start a conversation just meant to point out the security guard thingy he should have . but i don’t know korean i would tweet him about it though. LOL. No worries my dear @Pierrot. i thought he took a selca, no??? I didn’t know Jun-chan is a Chelsea fan. 🙂 I wonder who snapped the picture, but he sounds pretty playful so I may guess it was nothing serious. hello @Angie…on another angle, you have a point. why would he laugh? is it being playful or is that his way of coping with sasaeng’s hideous and despicable acts? some people laugh when scared because it calms them and this type of people are people who don’t want to lose control or creep themselves since they are alone. This does not sasaeng again???? Not about Saseng, I think he meant he leaned against his bed then took selca. sorry but…. which chelsea is he talking about? 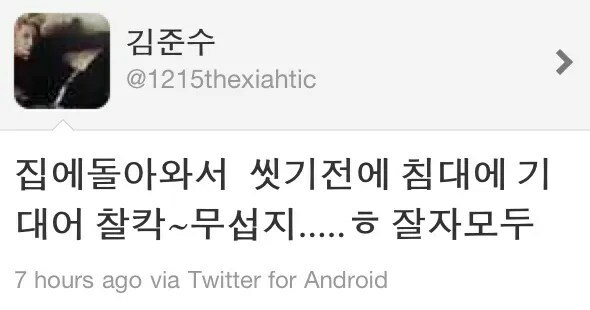 Maybe he forgot to attach his selca then just tweeted it LOL how cute! The creepy crawlers are lurking but hope Junsu ignores them or call the police! LOL! That’s so like him! Jun-fail~ what a scare though. oh wait. why did he said ‘scary right’? what picture ? did he tweet a pic ???? i thought he meant someone took a pic of him , like he was lying then suddenly he heard a snapshot. is how i got it. lol. probably. or, he’s saying that he’s becoming paranoid. lol. anyway, what u said is right. korean fans would understand his writings better.. some words just cannot be translated directly without being misunderstood i guess. thx. But I would love to see his picture that he took. Coz I wanna know if he’s all good and healthy. oh you mean its not the sasaeng’s creepy picture taking of junsu but his selca? hey i didn’t think about that possibliity. but that seems like the most reasonable one. Maybe one of his friends took a picture of him and caught him off guard. Ok I am not worried now that someone was in his house that should not have been. well , sasengs are sadakos , so they are ghosts . The “찰칵” is the sound of a shutter of a camera snapping. junsu meant HE TOOK A PICTURE OF HIMSELF–he was teasing fans! i hope he tweets a pic so we do understand he took a pic of himself , but somehow the way he said it, like he was about to rest when he heard a snapshot, and that’s scary that he heard it but not see anything. in fan meetings i think fans will ask about this. they always ask about his tweets right? Lol, Junsu’s twitter fail. Now all he needs to do is post the photo so we can see how scary it is (though I doubt anything with Junsu in it is scary). OMG! Su please NEVER do that again! That is sooooo not funny! I almost head a heart attack! Anyway I prefer Chelsea. I’m not bias, actually most of my friend like MU too. I don’t like it since Sir.F sold Beckham to Real Madrid. I think Sir.F has manipulate the club in political way but no doubt he is smart where he really growth the club strategically. He actually sold Beckham to Real Madrid. Due to this, Beckham was force to move out of his home country. I got to know this coz I love to read biography. ¡Cutie pie!!!! You know I love you; don’t you?